Lanjigarh block, Kalahandi, Orissa, May 17: At its summit, the northeastern ridge of the Niyamgiri hill range has a bald patch, typical of hilltops with bauxite deposits. A dense tree cover that provides a welcome shade to climbers struggling some 8 km up the steep forest path gives way to a vast stretch of open grassland. A full-grown leopard silently pads across the open expanse. Up here, all is at peace. For now. Down below, in Lanjigarh and in the faraway plains of Bhubaneswar and New Delhi, a battle is being fought over this hilltop. On one side are environmental, political and human rights activists and local people who wish to preserve this hill, its forests, and a way of life. On the other, is a multi-million dollar company, Vedanta Resources Plc, powerful enough to bend rules, which wants to tear open the hilltop for what lies beneath, and a state government eager to hand over its mineral treasures to private companies. The final decision rests with the Supreme Court. Stakes are high, on all sides. The key element in this story is bauxite, the principal raw material for a much-in-demand metal—aluminium. Widely used in construction, as packaging material and for making automobile and aircraft bodies, global aluminium consumption increased from 32 million tonnes in 2005 to 35 million tonnes in 2006. It is expected to grow at similar levels in 2007, spurred largely by Chinese demand. At the same time, environmental regulations and a costly, power-intensive production process—it takes 2-3 tonnes of bauxite to produce a tonne of aluminium—have led to scaling down of aluminium production in the West. But in India, which has a fifth of the world's bauxite sources, matters are different. Here, the industry's capital costs are among the lowest, and environmental compliance, more often than not, only gets lip service. Over 50 per cent of India's bauxite resources are found in the hills of southern Orissa, including the Niyamgiri range in Kalahandi—the setting for our story. This story begins on June 6, 2002, when a land acquisition and a gram sabha notice was issued to villagers for the "proposed Lanjigarh alumina refinery project". It was said that the project would be set up by the London-based industrialist Anil Agarwal's Sterlite Industries of India Limited—the company had a memorandum of understanding (MoU) for a mining project with the Orissa government, dating back to 1997. The notice of the district administration proclaimed that when the project materialised, 12 villages would be razed, 60 families displaced and 302 families would lose their farmland. Protests were immediate because many feared losing their lands, and partly because the mostly tribal villagers of this region venerate this hill. Media reports of the time say that nearly 1,000 people gathered at the district revenue office soon after the notice was issued and submitted a memorandum opposing the project. Another 200 individual protest petitions were filed. In April 2003, 250 anti-project demonstrators were attacked by about 100 armed men. A People's Union for Civil Liberties' report on the incident noted: "The people are terrorised, and believe (perhaps rightly) that their attackers enjoy police support." In July 2003, the district administration evicted 64 tribal families of Jaganathpur village from their land. This, say activists, was done in violation of constitutional provisions against alienation of tribal land. Villagers were given no compensation, because their fields were listed as government revenue land. "What kind of government is this, which takes our land away instead of protecting us?" asks Khumti Majhi, who lost his fields and now is a leader of the Niyamgiri Surakhya Samiti, one of three citizens' group—along with Green Kalahandi and Sachetan Manch—fighting the project. On June 7, 2003, the Orissa government signed a fresh MoU with Sterlite. 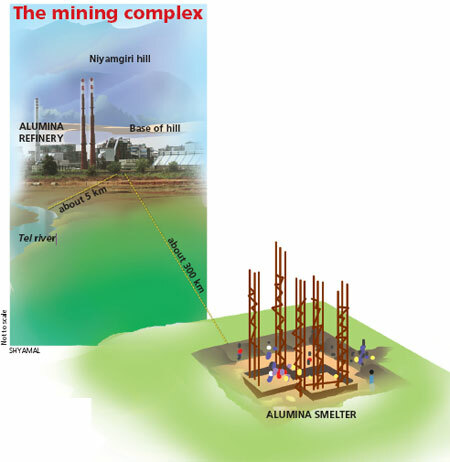 The deed envisaged a 3 million tonne per annum (TPA) bauxite mine on top of the northwest ridge of the Niyamgiri hills, a 1 million TPA alumina refinery with a 75 MW captive power plant at the foot of the hills and a 500,000 TPA alumina smelter. The aluminium oxide processed in the Lanjigarh refinery would be transported some 300 km away to Brindamal in Jharsuguda district where it would be converted into aluminium. Sterlite estimates that the project will cost about Rs 4,000 crore. But this does not take into account the cost of land. The company says it requires 1,444.67 hectares (ha), split into 721 ha for the mine and power plant and 723 ha for the refinery. Most of the latter was privately cultivated. But tribals tilling this land had little proof of ownership—as in most of tribal Orissa, where land records are virtually non-existent. So, the land was officially recorded as state-owned revenue land. The land needed for the refinery also includes 58.943 ha of forestland, which consists of 29 ha of village forest ("gramya jungle jogya") and 30 ha of reserve forest, according to the Central Empowered Committee (CEC)—the Supreme Court-appointed body which looks into encroachments on forests, which came into the picture later. The land needed for mining includes 672 ha of forest land in two forest divisions—Rayagada and Kalahandi south—and privately cultivated land, according to the project's EIA. By February 2004, the state had acquired 232.5 ha from cultivators for "public purpose" under the Land Acquisition Act, 1894. People told this reporter that Sterlite began clearing land for the refinery the same month. Very soon, a colony emerged. Many villagers were shifted into Vedantanagar, a gated rehabilitation colony with concrete box-like houses at the base of the Niyamgiri hills, which this reporter visited. Villagers told her that while some of those who were moved were there because they had accepted the one-time cash compensation for their land, others were there because they had no choice. Jaswant Majhi of Kinari village told this reporter that he had been forcibly taken to Vedantanagar. "We have no land to till, the district collector forced us to give it up," said Jogi Majhi, also originally from Kinari. Majhi says he was given Rs 4 lakh as compensation for his 2.5 ha. He invested the money in post office savings schemes and his family of six has been living off it since. But without any other income, his savings have dwindled to Rs 2 lakh. His options will run out soon. His son has been promised a job at the refinery, but that hasn't happened yet. The colony, villagers say, was initially manned by armed company guards who didn't allow them to speak to outsiders. When this reporter visited Vedantanagar, she was questioned by at least eight young men on motorbikes in VAL uniforms. The villagers she was talking to fled the scene, immediately. In March 2003, Sterlite applied to the Union ministry of environment and forests (MoEF) for environmental clearance for the proposed refinery. The application made no mention of the 58.9 ha of forestland it required. It filed a separate petition for clearances under the Forest Conservation Act (FCA), 1980, on August 16, 2004, through the Orissa Industrial Infrastructure Development Commission—according to the MoU between Sterlite and the government, the latter has to secure clearances. Later, in its affidavit to CEC, the company explained its position: "Gramya jungle jogya [suitable for village forest] land within the alumina refinery is not a forest land since it is still in the custody of the Revenue Department. It is described in the revenue records only as 'suitable for village forest' and not as forest land… Further since the proposal for the diversion of 30 ha was for 'mine access road' and 'conveyor corridor' it could also be included in the mining proposal." On March 24, 2004, MoEF informed the company that as the refinery would be dependent on the mining proposal being cleared, the ministry would consider the two proposals together. The next day, the mining company sent MoEF another application arguing that while it would take three years to build the refinery, only a year was required to open the mines. Six months later, on September 22, 2004, MoEF reversed its decision and granted the refinery environmental clearance on condition that Sterlite got mining clearance before "operationalising" the refinery. The approval letter also stated: "The project does not involve diversion of forest land." This, despite the fact that another division of the ministry had received an application for FCA clearance for the refinery. In October 2004, Sterlite, which by now had transferred the project to its subsidiary, Vedanta Alumina Ltd (VAL), and started construction, signed a mining lease agreement with the state-owned Orissa Mining Corporation (OMC). The agreement gave VAL 74 per cent stake in a joint venture with OMC, a right to have four of its representatives on the six-member board of directors, as well as the positions of managing director and chairperson—a departure from the convention of a government representative holding the chairperson's post in joint ventures. VAL would control day-to-day mining operations, and would get sole rights over the mined bauxite. OMC's only role in this collaboration would be to get the requisite clearances. A month after the lease was signed, Orissa's forest department sent Vedanta a show-cause notice for encroaching on 10.41 acres (4.21 ha) of village forestland for its refinery. It also notified MoEF of the encroachment. Around the same time, Sreedhar Ramamurty, director of the Academy for Mountain Environics, Dehradun, which works on mining issues, Biswajit Mohanty, Orissa-based environmental activist, and Prafulla Samantara, human rights activist, separately petitioned CEC to halt the company's operations. "This is one of the dirtiest examples of how a corporate can violate laws with government connivance," says Mohanty. The main issues raised by the petitioners were: inadequate environmental impact assessment, violation of forest conservation and environmental laws; violation of Schedule V of the Indian Constitution protecting tribals from land alienation; and destruction of an important cultural landmark. In December 2004, CEC sent a two-member team to Lanjigarh. 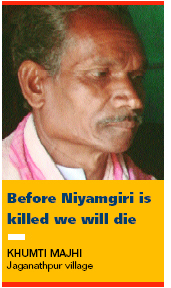 Its September 2005 report to the Supreme Court recommended that mining not be permitted on Niyamgiri hill. The report was a scathing indictment of the project and questioned the integrity of the authorities involved. In February 2006, the apex court referred the matter to MoEF's Forest Advisory Committee (FAC)—which looks into diversion of forestland for non-forest purposes—and asked for a report in three months. FAC, in turn, asked the Wildlife Institute of India (WII) and Central Mine Planning and Design Institute Limited (CMPDIL), a subsidiary of Coal India Ltd, to assess the project for soil erosion and impact on water resources. CMPDIL, according to Vedanta's lawyers' statements during Supreme Court hearings on May 16 and May 18, 2007, cleared the project of all water-related concerns. 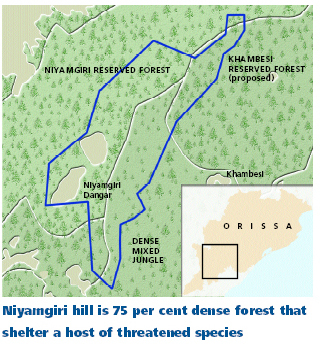 But WII's report submitted in June 2006, a copy of which is with Down To Earth (DTE), warned that "bauxite mining in Niyamgiri plateau will destroy a specialised wildlife habitat". However, following a special presentation by Orissa forest officers, the institute tagged on a supplementary report in October 2006, which included a Rs 42-crore plan for mitigation of impact on wildlife. Zoologist Sushant Chowdhury, one of the authors of the report, told DTE that "there was always a way to mitigate impact on wildlife. The supplementary report is not a revised report but a response to objections of the Orissa government". He refused to elaborate saying the matter was sub judice. Anyhow, based on the two reports, FAC recommended diversion of forestland for the mining project. But there was a hitch. In another matter, the Supreme Court had already ordered a review of clearances granted by FAC after September 15, 2006. This included the VAL project. On December 8, 2006, the court asked CEC to file more comments. When the matter was heard on May 16 and 18, 2007, CEC iterated its stand that MoEF had acted irresponsibly and with "undue haste" in granting Vedanta clearances. It added that the company had been "conveniently shifting its stand" to keep the project running. Towards the end of this hearing, the court observed that once destroyed, the ecosystem could not be regenerated easily. Vedanta and CEC were asked to propose alternative mining sites. The matter will be heard again when the court reopens. Amidst all this, VAL has been on track. The power plant was commissioned in February 2007 and the refinery has been on a trial run since the last week of March 2007. "We are sourcing bauxite from our mines in Chhattisgarh and from Gujarat. We are planning to keep our equipment ready for when the clearances come through," says Umesh Mehta, VAL's vice-president (commercial) at Lanjigarh. A hundred yards from the refinery, villagers of Bandhaguda recount how the first night the refinery fired up its machinery, a host of confused animals ran down the hills. The project needs more than rich forests. It requires power generation as well as roads to transport minerals. 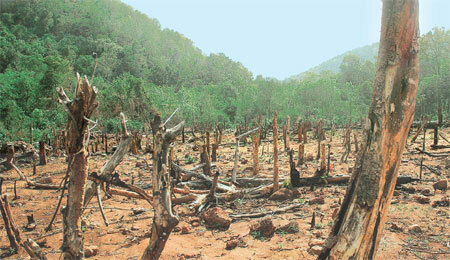 The environmental impacts of the project are linked. According to the project's EIA report, the mines alone will consume around 33,000 tonnes of water per year. This will be sourced from the Tel river at Kesinga through a 65-km pipeline. The river is an important source of irrigation and drinking water for people in Bolangir district downstream. Researchers with the Centre for Science and Environment's (CSE's) Green Rating Project, say the daily water consumption at the mine would meet the water requirements of 600,000 people—using a conservative figure of 55 litres per day as against the 200 litres daily consumption in Delhi. If the water consumption is taken over the mines' entire life (25 years), they will use water needed by over 15 million people. Tel is a seasonal river, which used to be dry for almost eight months in a year. Its current summer flow is based on surplus from the Indrawati multipurpose project, because its canal system has not been completed. Once the command area irrigation works are completed, the river will have no flows in summer. Also, if mining does impact the flow of Vamsadhara and Nagavali rivers and the 36 streams flowing out of Niyamgiri range, water availability of Tel will further go down. No details are available on water consumption by the refinery and the captive power plant. But estimates based on water consumed in other alumina refineries and power plant show that the refinery will consume around 2-3 million tonnes of water annually. The power plant's water consumption would increase the project's water footprint considerably. If this plant of 75 MW operates for 300 days for 24 hours at an efficiency of 75 per cent, its water consumption would be roughly 35 million tonnes per annum. The state water resources department admits that there has been no assessment of the ecological and economic impacts of the project's water needs. But water skirmishes have begun. 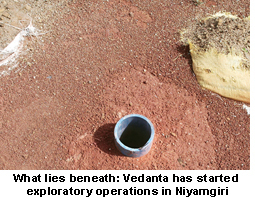 Early this year, villagers reported that Vedanta had installed several deep bore wells along the pipeline to tap groundwater. Following these complaints Orissa's water resources department sent a team to Lanjigarh four months ago and shut most of the wells down. "We urgently need groundwater legislation that will require people to get a permit to dig borewells," says Aurobindo Behera, principal secretary, state water resources department. "But even then, we won't allow Vedanta to tap groundwater if it affects the local water supply," he asserts. According to the project's EIA report, its stripping ratio is 1:13. 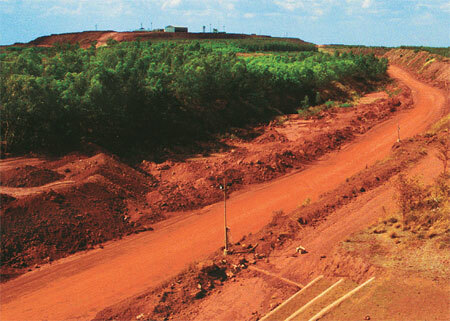 This means a tonne of bauxite will have a by-product of around 13 tonnes of soil, rock and mud. Since the project will produce 3 million tonnes of bauxite, 39 million tonnes of solid waste will be dumped on the hills, annually. The EIA reports says, "The overburden and topsoil will be dumped in the identified area as per the mining plan and will be stacked separately and will be used for backfilling as and when bauxite is completely exploited from the pits." However, CSE analysts say handling such amounts of overburden would be hard, especially since the mine site is on a hilltop. The dust and run off from the dumps will affect farmlands and pollute streams. Solid waste generated at the refineries during bauxite processing comes out as red mud and storing it is one of the biggest problems faced by alumina refineries. This highly alkaline by-product is usually stored in a tailing pond and if not contained can pollute groundwater. Vedanta's refinery will produce 1.28 million tonnes of red mud every year. All this will be stored along the Vamsadhara. Any damage or breach of red mud pond or ash pond may create disasters like the one in 2000 at National Alumina Corporation's (NALCO's) refinery in Damanjodi, Koraput, which devastated villages living in the vicinity of the plant. Given that Vedanta will be transporting alumina from its refinery to its smelter in Jharsuguda about 300 km away, the smelter's environmental impact too needs to be studied. To ferry 3,030 tonnes of alumina daily (assuming 330 days of operation), about 121 trucks will have to ply the road from Lanjigarh to Brindamal in Jharsuguda. This increased traffic, apart from being a nuisance to the local community, will lead to fugitive dust and vehicle emissions and noise pollution. The smelter will require an estimated 3.6 million tonnes of water annually (one tonne of aluminium production from alumina in a smelter requires about 7 tonne of water). The water footprint, however, will be much higher since the smelter project includes a 1,250-MW captive power plant. The biggest concern about an aluminium smelter is fluoride emissions and waste (consisting of fluoride and cyanide) released from its smelting pot, called smelt pot lining. Considering the capacity of the proposed smelter, it would emit about 325 tonnes of fluoride every year. Moreover, shortterm inhalation exposure to gaseous hydrogen fluoride can cause severe respiratory damage in humans, including severe irritation and pulmonary edema. An expert team which visited NALCO's smelter plant in Angul in 2002, found cattle suffering from fluorosis. The team, which visited the site as part of the Norwegian Environment Cooperation Programme, also found a few incidences of fluorosis among local people. These environmental impacts of mining and refineries can be mitigated and managed. But it will need vigilance and enforcement by the government. Local community representatives told DTE that given the companies past record they apprehend this won't happen. The key element in this story is bauxite, the principal raw material for a much-in-demand metal--aluminium. Widely used in construction, as packaging material and for making automobile and aircraft bodies, global aluminium consumption increased from 32 million tonnes in 2005 to 35 million tonnes in 2006. It is expected to grow at similar levels in 2007, spurred largely by Chinese demand. At the same time, environmental regulations and a costly, power-intensive production process--it takes 2-3 tonnes of bauxite to produce a tonne of aluminium--have led to scaling down of aluminium production in the West. But in India, which has a fifth of the world's bauxite sources, matters are different. Here, the industry's capital costs are among the lowest, and environmental compliance, more often than not, only gets lip service. Over 50 per cent of India's bauxite resources are found in the hills of southern Orissa, including the Niyamgiri range in Kalahandi--the setting for our story. This story begins on June 6, 2002, when a land acquisition and a gram sabha notice was issued to villagers for the "proposed Lanjigarh alumina refinery project". It was said that the project would be set up by the London-based industrialist Anil Agarwal's Sterlite Industries of India Limited--the company had a memorandum of understanding (mou) for a mining project with the Orissa government, dating back to 1997. The notice of the district administration proclaimed that when the project materialised, 12 villages would be razed, 60 families displaced and 302 families would lose their farmland. Protests were immediate because many feared losing their lands, and partly because the mostly tribal villagers of this region venerate this hill. Media reports of the time say that nearly 1,000 people gathered at the district revenue office soon after the notice was issued and submitted a memorandum opposing the project. Another 200 individual protest petitions were filed. In April 2003, 250 anti-project demonstrators were attacked by about 100 armed men. A People's Union for Civil Liberties' report on the incident noted "The people are terrorised, and believe (perhaps rightly) that their attackers enjoy police support." 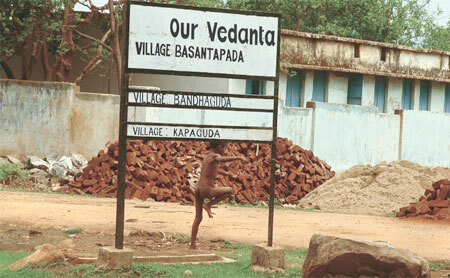 In July 2003, the district administration evicted 64 tribal families of Jaganathpur village from their land. This, say activists, was done in violation of constitutional provisions against alienation of tribal land. Villagers were given no compensation, because their fields were listed as government revenue land. "What kind of government is this, which takes our land away instead of protecting us?" asks Khumti Majhi, who lost his fields and now is a leader of the Niyamgiri Surakhya Samiti, one of three citizens' group--along with Green Kalahandi and Sachetan Manch--fighting the project. Sterlite estimates that the project will cost about Rs 4,000 crore. But this does not take into account the cost of land. The company says it requires 1,444.67 hectares (ha), split into 721 ha for the mine and power plant and 723 ha for the refinery. Most of the latter was privately cultivated. But tribals tilling this land had little proof of ownership--as in most of tribal Orissa, where land records are virtually non-existent. So, the land was officially recorded as state-owned revenue land. The land needed for the refinery also includes 58.943 ha of forestland, which consists of 29 ha of village forest ("gramya jungle jogya") and 30 ha of reserve forest, according to the Central Empowered Committee (cec)-- the Supreme Court-appointed body which looks into encroachments on forests, which came into the picture later. The land needed for mining includes 672 ha of forest land in two forest divisions--Rayagada and Kalahandi south--and privately cultivated land, according to the project's eia. In March 2003, Sterlite applied to the Union ministry of environment and forests (moef) for environmental clearance for the proposed refinery. The application made no mention of the 58.9 ha of forestland it required. It filed a separate petition for clearances under the Forest Conservation Act (fca), 1980, on August 16, 2004, through the Orissa Industrial Infrastructure Development Commission--according to the mou between Sterlite and the government, the latter has to secure clearances. Later, in its affidavit to cec, the company explained its position "Gramya jungle jogya [suitable for village forest] land within the alumina refinery is not a forest land since it is still in the custody of the Revenue Department. It is described in the revenue records only as 'suitable for village forest' and not as forest land... Further since the proposal for the diversion of 30 ha was for 'mine access road' and 'conveyor corridor' it could also be included in the mining proposal." On March 24, 2004, moef informed the company that as the refinery would be dependent on the mining proposal being cleared, the ministry would consider the two proposals together. The next day, the mining company sent moef another application arguing that while it would take three years to build the refinery, only a year was required to open the mines. Six months later, on September 22, 2004, moef reversed its decision and granted the refinery environmental clearance on condition that Sterlite got mining clearance before "operationalising" the refinery. The approval letter also stated "The project does not involve diversion of forest land." This, despite the fact that another division of the ministry had received an application for fca clearance for the refinery. In October 2004, Sterlite which by now had transferred the project to its subsidiary, Vedanta Alumina Ltd (val), and started construction, signed a mining lease agreement with the state-owned Orissa Mining Corporation (omc). The agreement gave val 74 per cent stake in a joint venture with omc, a right to have four of its representatives on the six-member board of directors, as well as the positions of managing director and chairperson--a departure from the convention of a government representative holding the chairperson's post in joint ventures. val would control day-to-day mining operations, and would get sole rights over the mined bauxite. omc's only role in this collaboration would be to get the requisite clearances. "This is one of the dirtiest examples of how a corporate can violate laws with government connivance," says Mohanty. The main issues raised by the petitioners were inadequate environmental impact assessment, violation of forest conservation and environmental laws; violation of Schedule V of the Indian Constitution protecting tribals from land alienation; and destruction of an important cultural landmark. In December 2004, cec sent a two-member team to Lanjigarh. 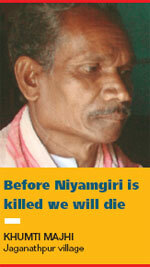 Its September 2005 report to the Supreme Court recommended that mining not be permitted on Niyamgiri hill. The report was a scathing indictment of the project and questioned the integrity of the authorities involved. In February 2006, the apex court referred the matter to moef's Forest Advisory Committee (fac)--which looks into diversion of forestland for non-forest purposes--and asked for a report in three months. According to cec and wii, the hills are the source of the Vamsadhara river and a major tributary of the Nagvalli river. Both rivers supply water to several districts of southern Orissa and Andhra Pradesh.Thirty-six perennial streams originating around the mining lease site provide drinking water and water to irrigate fields in the adjoining villages. The project's eia report by Tata aig consultants agrees in part. It says, "The area exhibits a well-balanced ecosystem with a poised prey-predator relationship." But it goes on to add that though "the secondary data identifies a variety of faunal species under categories like endangered and vulnerable as per the Zoological Survey of India's Red Data... primary survey does not show all of the mammalian species listed". The report also describes the actual mining area on the plateau, which is open grassland, as not useful for wildlife and forests. However, the first wii report counters this. It notes, "These plateaus are very productive with high occurrence of several herbivore and carnivore species." Even as the presence of wildlife was being debated in Delhi's apex court, DTE secured clinching evidence of the area's wildlife. On May 17, our photojournalist captured a full-grown leopard on camera as it silently walked across the open grassland of Niyamgiri. So, will mining on the hills cause irreparable harm to wildlife? The state government does not think so. Suresh Mohanty, Orissa's principal chief conservator of forests (wildlife), told dte "Lanjigarh forest belt is over 20,000 ha and "even if 600 or 700 ha of this is lost, animals will switch over to newer habitats. Animals can also adjust to certain interventions." He added, "Human usage and development proposals can't be wished away, so wildlife has to adjust to fulfil these requirements." Their numbers are fast dwindling-- according to the 2001 census the current population of the Dongrias is less than 8,000. The state government, however, says "the mining activities will not affect Dongria's livelihood, custom, practices and their lifestyle, because they don't live there". According to the project's eia report, the mines alone will consume around 33,000 tonnes of water per year. This will be sourced from the Tel river at Kesinga through a 65-km pipeline. The river is an important source of irrigation and drinking water for people in Bolangir district downstream. Researchers with the Centre for Science and Environment's (cse's) Green Rating Project, say the daily water consumption at the mine would meet the water requirements of 600,000 people--using a conservative figure of 55 litres per day as against the 200 litres daily consumption in Delhi.If the water consumption is taken over the mines' entire life (25 years), they will use water needed by over 15 million people. According to the project's eia report, its stripping ratio is 113. 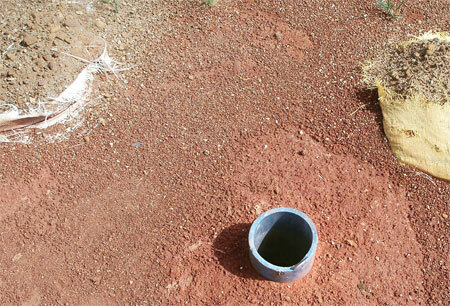 This means a tonne of bauxite will have a by-product of around 13 tonnes of soil, rock and mud. Since the project will produce 3 million tonnes of bauxite, 39 million tonnes of solid waste will be dumped on the hills, annually. The eia reports says, "The overburden and topsoil will be dumped in the identified area as per the mining plan and will be stacked separately and will be used for backfilling as and when bauxite is completely exploited from the pits." However, cse analysts say handling such amounts of overburden would be hard, especially since the mine site is on a hilltop. The dust and run off from the dumps will affect farmlands and pollute streams. Solid waste generated at the refineries during bauxite processing comes out as red mud and storing it is one of the biggest problems faced by alumina refineries. This highly alkaline by-product is usually stored in a tailing pond and if not contained can pollute groundwater. Vedanta's refinery will produce 1.28 million tonnes of red mud every year. All this will be stored along the Vamsadhara. 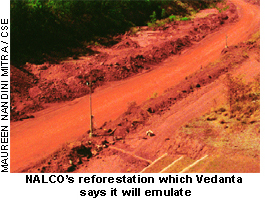 Any damage or breach of red mud pond or ash pond may create disasters like the one in 2000 at National Alumina Corporation's (nalco's) refinery in Damanjodi, Koraput, which devastated villages living in the vicinity of the plant. Given that Vedanta will be transporting alumina from its refinery to its smelter in Jharsuguda about 300 km away, the smelter's environmental impact too needs to be studied. To ferry 3,030 tonnes of alumina daily (assuming 330 days of operation), about 121 trucks will have to ply the road from Lanjigarh to Brindamal in Jharsuguda. This increased traffic, apart from being a nuisance to the local community, will lead to fugitive dust and vehicle emissions and noise pollution. The smelter will require an estimated 3.6 million tonnes of water annually (one tonne of aluminium production from alumina in a smelter requires about 7 tonne of water). The water footprint, however, will be much higher since the smelter project includes a 1,250-mw captive power plant. The biggest concern about an aluminium smelter is fluoride emissions and waste (consisting of fluoride and cyanide) released from its smelting pot, called smelt pot lining. Considering the capacity of the proposed smelter, it would emit about 325 tonnes of fluoride every year. Moreover, short-term inhalation exposure to gaseous hydrogen fluoride can cause severe respiratory damage in humans, including severe irritation and pulmonary edema. An expert team which visited nalco's smelter plant in Angul in 2002, found cattle suffering from fluorosis. The team, which visited the site as part of the Norwegian Environment Cooperation Programme, also found a few incidences of fluorosis among local people. 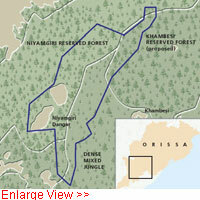 The next day the company dashed off a letter to moef seeking withdrawal of its request for forest clearance for the refinery saying it didn't need the 58.9 ha after all.The state government sent moef a letter recommending withdrawal of the proposal on March 27, 2005, which happened to be a Sunday. The very next day, the ministry withdrew its stop work order, without bothering to look into why the company had changed its stance. Or, as the cec report later said, "without examining its effect, propriety, linkage with environmental clearance". Vedanta's legal gymnastics on the matter have been remarkable. At cec hearings, it first said mining on Niyamgiri was absolutely necessary for its project, then when questioned by cec about starting work on the refinery without having mining clearance, it came out with the statement that the mines and refinery were separate projects and if the mines weren't approved it would ship in the bauxite from elsewhere. In response, cec observed that if the mine wasn't absolutely necessary, approval could not be granted under fca. Vedanta immediately performed a perfect back flip. It now insisted the Lanjigarh refinery could not function without the Niyamgiri mines. Vedanta isn't the only company eyeing Orissa's high-quality bauxite. At least two more companies--Utkal Alumina India Ltd and multinational giant bhp Billiton--have mining and refinery projects in the pipeline. nalco, one of the companies mining bauxite in the state, is mulling expansion of its mines. Low-priced, good quality bauxite, cheap labour and low production costs combined with proximity to ports, make mining an attractive proposition in Orissa. Only a small quantity of bauxite, as raw material for aluminium, is sold in Indian markets, because most aluminium makers have captive mines. In the international market, bauxite is priced at us $100 per tonne (over Rs 4,000), while in India, the estimated cost to mine bauxite is Rs 225 per tonne.The price of aluminium in the global market is us $2,680 per tonne--over Rs 1,00,000 as per June 20, 2007. Indian companies can make a killing in this market with their captive bauxite mines. This explains the gold rush to Orissa.